Circulation Fans: The S01 Ventilation System has a wide range of circulation fans that have been designed to move the maximum amount of air, with as little noise and energy consumption as possible. These S01 fans have been designed for heavy-duty commercial/industrial use and will last for years. Air King Fan: The 6 inch clip on fan has impact resistant plastic grills with chemical resistant polypropylene blade, 2-speed and 1/300 HP motor. The 12 inch Wall Mount fan has a powder coated steel front grill with impact resistant plastic rear grill and chemical resistant polypropylene blade, 3-speeds and a 1/50 HP motor. The 16 inch Wall Mount fan has a powder coated steel front grill with impact resistant plastic rear grill and chemical resistant polypropylene blade, 3-speeds and a 1/20 HP motor. The 18 inch Wall Mount fan has a powder coated steel front grill with impact resistant plastic rear grill and chemical resistant polypropylene blade, 3-speeds and a 1/20 HP motor. 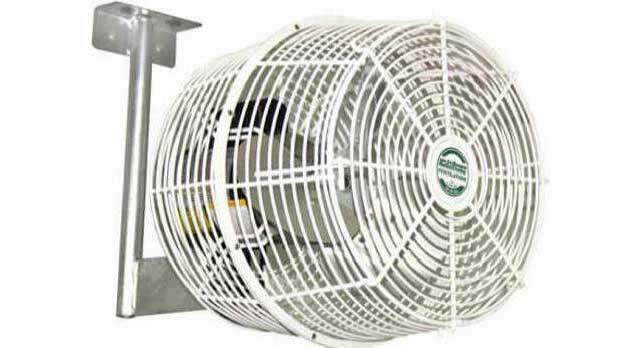 Air Flow HAF Fans: Greenhouses require a specialized HAF fan, and our Air Flow HAF fan is simply the best. The Air Flow HAF fan reduces heating costs by creating a uniform temperature throughout your structure. Adjust the air pattern and reduce the fan speed directly on your plants to harden them before shipping to market. Low velocity air can also be used to stimulate hair follicle to improve plant health. The Air Flow HAF Fan is the most versatile, energy efficient, best valued HAF fan on the market today. Oscillating FansThese excellent quality wall mount fans feature 3 speeds with a speed control knob and cord. The fans have a powder coated steel grill and a chemical resistant polypropylene blade. They can oscillate 90 degrees or can be locked in a non-oscillating position. The fan head can also be tilted up and down for more directional control. Both are very quiet and efficient. Ideal for home, greenhouses, garages, workshops and other areas with limited floor space. TF5™ livestock fan is a high velocity circulation fan designed to provide the ideal environment for maximum show animal comfort and hair growth. Built to withstand the impact of show travel, the F5 comes with dependable, long lasting motor and guards for extreme durability. Oscillating Circulation Fans Reduce heat stress and improve air quality with 36" oscillating circulation fans. Designed for high airflow and high efficiency, these versatile and durable fans are the ideal cooling solution for any industrial or commercial facility.